Welcome to 2017 summer markets! Looking for a way to enjoy your favourite cup of coffee amidst the heat of summer? 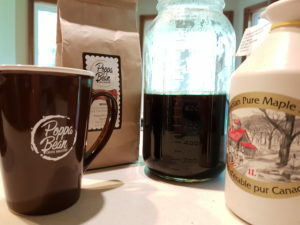 Poppa Bean Coffee Co. may have the solution that you’ve been looking for: cold brew coffee! Here’s how you can make your own cold brew coffee at home! According to Paul Foster of Poppa Bean Coffee Co., the ideal brew time for cold brew coffee is 24 hours, so mix your first batch now and stick it in the fridge! Your future self will thank you when the humidex climbs into the mid-30’s this weekend! Stir the ground coffee into the water and refrigerate overnight. The grounds should have settled to the bottom, but if not, strain them out before serving. Paul recommends indulging in decadence when drinking a cup of cold brew coffee, so he adds 10% cream and local maple syrup to his morning cup. Feeling fancier? Add ice and and put your cold brew coffee in the blender! You can find Poppa Bean Coffee Co.’s freshly roasted coffee beans (whole or ground) at the Lasndowne Farmers’ Market every Sunday at Lansdowne Park.